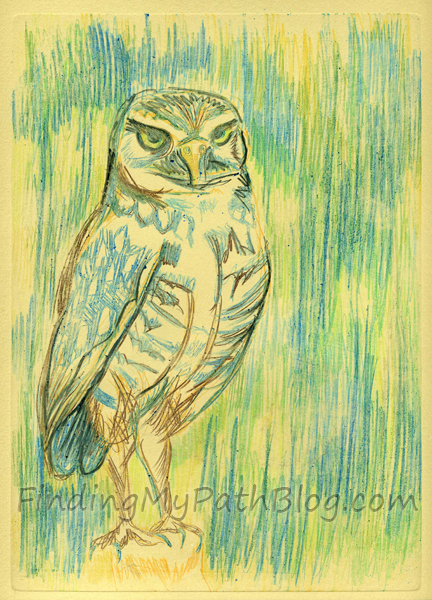 Monoprints…from a printmaking perspective you don’t get much ‘bang for your buck.’ You do a lot of work for 1 print! However, a few students in my printmaking class and my printmaking teacher have been experimenting with monoprints and so this week I decided to follow suit. 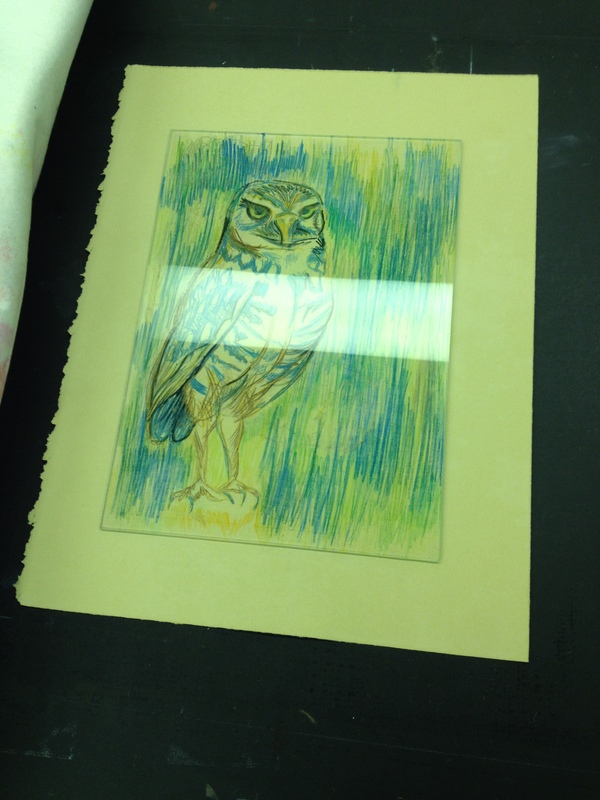 I’m taking a printmaking class at a local arts center and it is wonderful! Taking a class is motivating and the collaboration with other artists is great. I know that I sometimes feel isolated as an artist and don’t always fit into our world that seems powered by pop culture. To give an overview of the process I used to create these monoprints, I started with a piece of Plexiglas, sanded the surface with a sanding block and sandpaper and really took time to sand and round the edges with the sandpaper. I rinsed it off with water, dried it and my work surface was ready to go. I drew onto the plexi with watercolor pencils (I used prismacolor brand pencils). I’ve also heard that Derwent watercolor pencils work well. 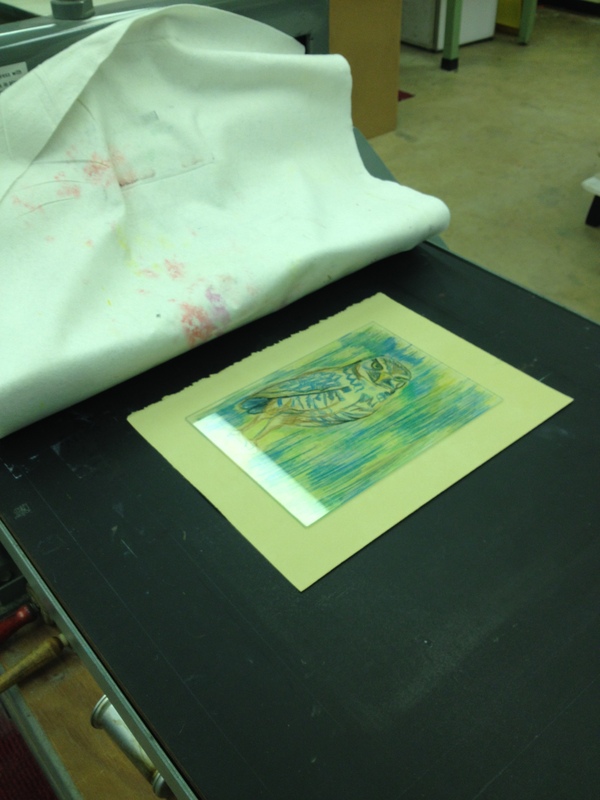 Once the image was drawn onto the plexi, I soaked my 100% rag printmaking paper in a water bath for 2 to 3 minutes, but not as long as I would typically soak paper for an etching. I removed my paper from the water bath, placed it between 2 heavy sheets of printmaking paper (blotting paper and please note, this paper will get ink on it over time, just hang it up and let it dry and reuse it for future blotting) and rolled it with a rolling pin to remove excess water. I placed the paper onto the press, laid the plexi on the paper face down, covered it with newsprint (this it to protect the blankets on the printing press) and ran that bad boy through the press. 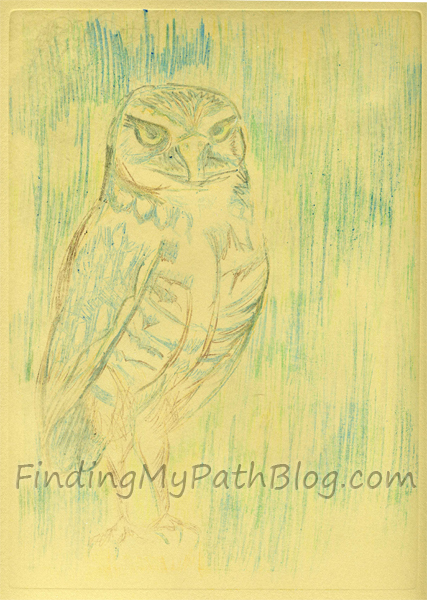 My second attempt was the ‘mature’ looking owl in blues and browns with the blue and green background. This one transferred much better and I did not need to hand color any of the print. ‘Wha-la’…a true monoprint. The lighter version of this same print is the “ghost” print. This simply means that I printed it a second time from the same piece of plexi on a new sheet of paper. 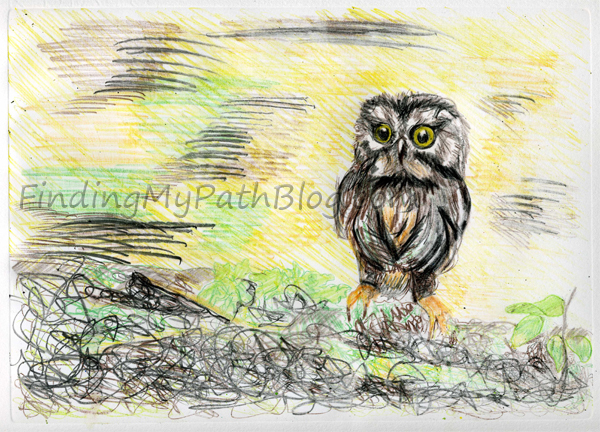 This entry was posted in Printmaking and tagged artist, colorful, monoprint, owl, owlet, playful, plexiglass, printing press, printmaking, watercolor pencils. Bookmark the permalink.